"A Prescription for the Soul is an intriguing and soul-searching novel that asks—and tries to answer—some very disquieting questions on American morality and values.”"
A Prescription for the Soul is published by Epicenter Books and distributed by Independent Publishers Group. 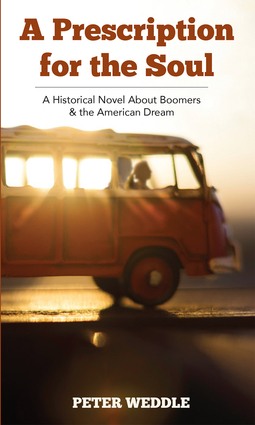 A Prescription for the Soul is a historical novel that follows a group of Baby Boomers who awaken as teenagers to their country’s social inequities and injustices and then awaken again as adults to a nation no less repressive and brutal. How they deal with that paradox shapes their lives, their legacy and ultimately the American Dream. Peter Weddle is a Boomer, army brat, and Vietnam era veteran . He is also the author or editor of over two dozen books and a former columnist for the interactive edition of The Wall Street Journal.